In many organizations, just getting started with Marketo programs tend to be more technical than strategic. Marketo becomes the workhorse of marketing automation, which is a great place to start. 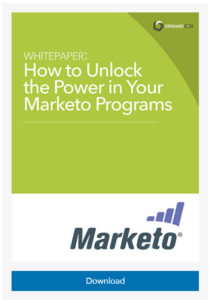 When set up properly, Marketo programs can support global processes and simplify operations across your marketing organization, saving time and money, and answering critical questions about how to better target your market and improve conversion rates.